Almost five years ago I posted my bucket list. Looking back it now I just want to say, "Poor April. You have no idea where life will take you. Bless." HAHA. But seriously, some of the items on my bucket list from 2011 would still be on there today and others...not so much. Left side is the original bucket list and the right side is the updated list. Some of the items previously included literally made me scratch my head...why would I ever put that on there? So you'll notice some of the items have been changed. Comments: I have zero desire to ever go on a cruise. Being trapped and surrounded by water...at the mercy of the waves and ocean? No thank you. I also have no desire why I put be a redhead on there. I did it, yes, but it wasn't a bucket list item. I modified my "live on a large body of water" to "living near a body of water". :) Also, no idea why I put Visit San Diego on there. Nothing against SD, but I have no desire to visit there...except for the zoo, which is amazing. I think that was my original line of thinking so I updated to say all the major U.S. zoos. Because zoos are my jam. Another befuddler is bake a loaf of bread. WHYYYYYYY is that on there? I have no idea. So I updated to a more normal one of "See the Northern lights." I probably won't have a chance to see them in Banff but I will definitely try. 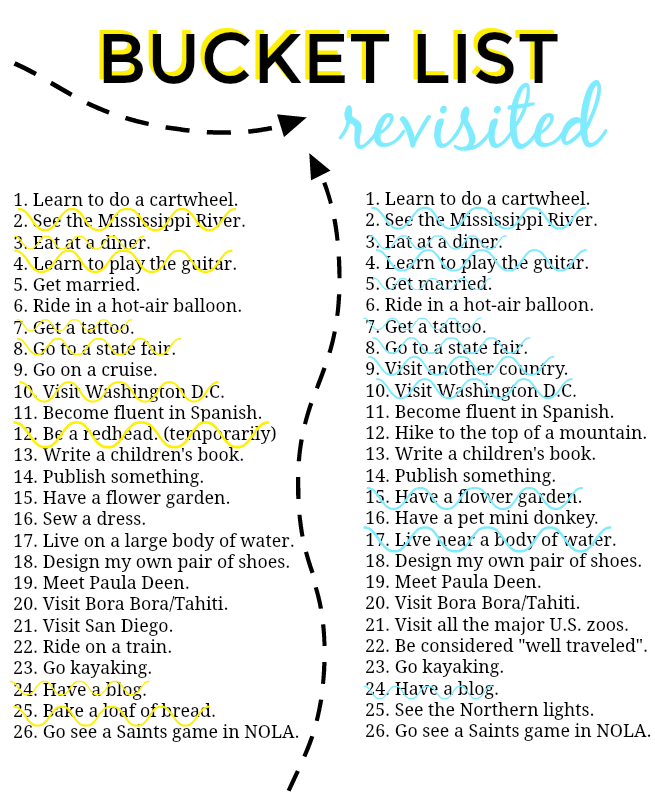 Do you have a bucket list? Do we share any items in common?? I'd love to hear! I was thinking of revising my 40 before 40 list since my travel plans have changed, but then thought eh I'm almost 40, I'll let it ride and just make another list after that one!